The ‘King of Kalgoorlie’, West Coast Eagles player Dom Sheed, returned to his hometown over the weekend with Assistant Coach Jaymie Graham, to be named by Mayor John Bowler as an honorary recipient of the golden key to the City. Dom Sheed, who had previously honed his skills with the John Paul College Saints and Mines Rover Football Clubs, sent the MCG crowd of 100,222 into a frenzy in the final moments when his clutch goal lifted the Eagles to the famous Grand Final victory against Collingwood on 29 September. Jaymie Graham played 37 games for the Eagles after starting his football career in Kalgoorlie for Mines Rovers Football Club, and stepped into the role of Senior Coach for the Eagles’ round two clash against the Western Bulldogs when Coach Adam Simpson made a dash back to Perth to be with his ailing daughter, Elsa. Presented by City of Kalgoorlie-Boulder Mayor John Bowler during the St Barbara’s Day Parade, Sheed was named an honorary recipient of the golden key to the City of Kalgoorlie-Boulder, whilst Graham received the honorary commendation of the City. “Both men are exemplary citizens of Kalgoorlie-Boulder, we commend their brilliance in their sporting careers and welcomed them with the highest regard on their return to their home town,” said Mr Bowler. The local sporting heroes even starred in the parade procession down Hannan Street on Sunday 2 December. The annual parade drew a crowd of over 4000 in attendance and is a public celebration of Saint Barbara, the patron saint of miners. “It was a real honour to have Dom and Jaymie take part in the annual St Barbara’s Day parade event, it was a fantastic opportunity to recognise their achievements and give residents the opportunity to meet the players. “Moments like this generate an immense sense of pride in our community,” Mr Bowler added. Speaking to the Kalgoorlie Miner, both players said the moment was a remarkable one. “I spent the first 16 or 17 years of my life in Kalgoorlie and I still call this place home. I love coming back when I do and catching up with everybody. It brings back a lot of memories and I really do love this place,” Sheed said. “Kalgoorlie has been great for me, growing up in town,” Graham said. Dom ‘Golden Boot’ Sheed, Jaymie Graham and Game Development General Manager Richard O’Connell used their time in the Goldfields to take the 2018 AFL Premiership Trophy on a victory lap of the City, giving locals the rare opportunity to pose with the cup for a photo. 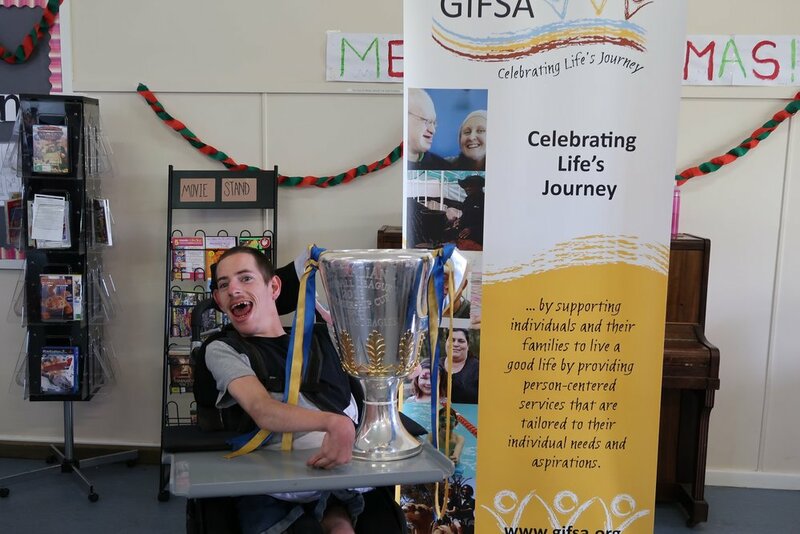 Wanting to engage with people with disability, the West Coast Eagles Football Club chose Goldfields Individual and Family Support Association (GIFSA) as the ideal organisation to contact, and arranged to have the Cup at their premises on Monday 3 December. The cup attracted a large crowd and the event was made all the more poignant given Monday was International Day of People with Disability. Sheed is also the nephew of GIFSA’s Chief Executive Officer Robert Hicks. 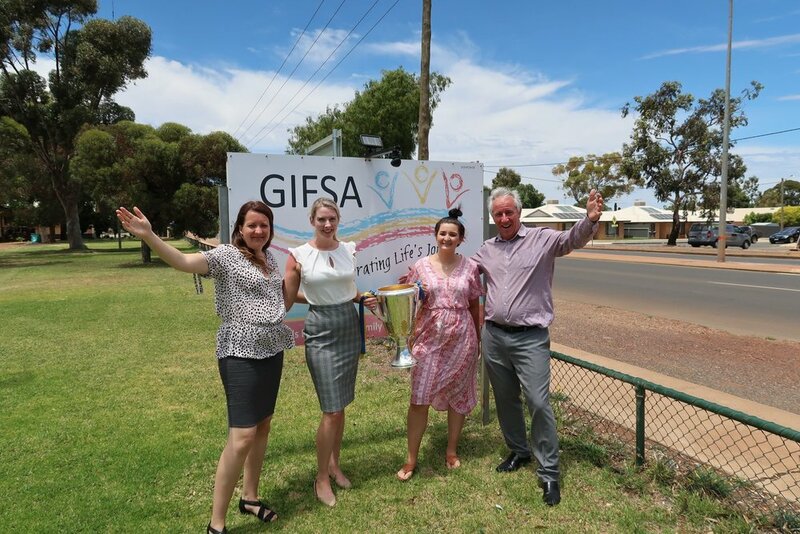 GIFSA is a not-for profit charity that has been providing important support service to people with disability, their families and carers throughout the vast Goldfields-Esperance region of Western Australia for the past 26 years. With offices in Kalgoorlie-Boulder, Esperance and the very remote Jameson Aboriginal community in the Ngaanyatjarra Lands, they employ over 100 local staff to deliver services to approximately 250 people. GIFSA is supported by members Norton Gold Fields, KCGM, Gold Fields, City of Kalgoorlie-Boulder and Kalgoorlie-Boulder Chamber of Commerce and Industry.